When the boundary column is strong enough and the horizontal rebars (distribution bars) get anchored inside the column’s core, a straight anchorage length can be used. When the boundary column is weak and its width is not long enough to allow for a straight an-chorage, it is mandatory to anchor the horizontal rebars by forming a hook at their ends. In this case, the disadvantage lays in the need for bending up the horizontal rebars in certain areas. 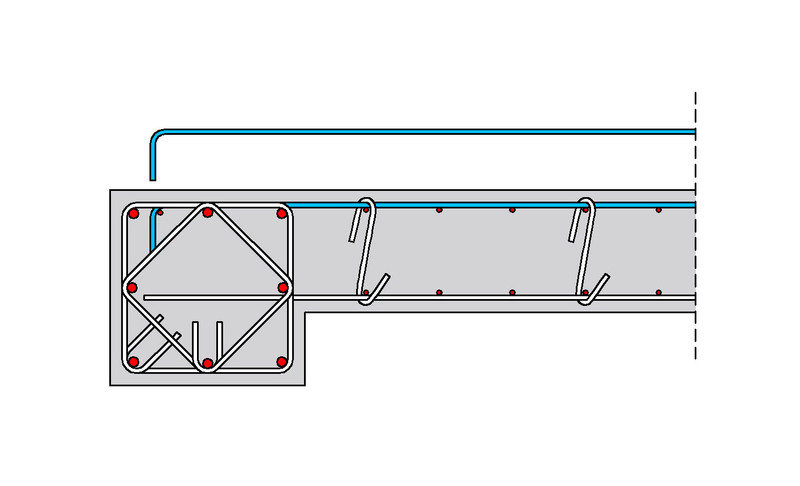 For Ø8 and Ø10 bars, this can be easily done during the implementation, with the use of a bending tool; however, for larger diameters it has to be done with a bending machine. In this case, the ‘S’-shaped reinforcement must restraint the horizontal rebars to the point where they intersect with the vertical ones. 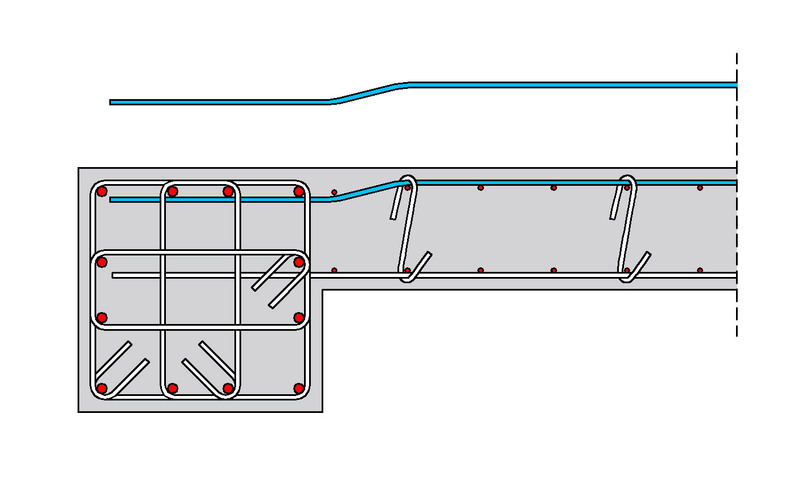 In this case, a straight anchorage is used and the horizontal rebars do not have to be bent. This increases their cover depth but since they mainly carry shear forces no serious problem arises. Moreover, the internal lever arm of the vertical rebars is diminished but only around 1cm so practically again, no problem appears. 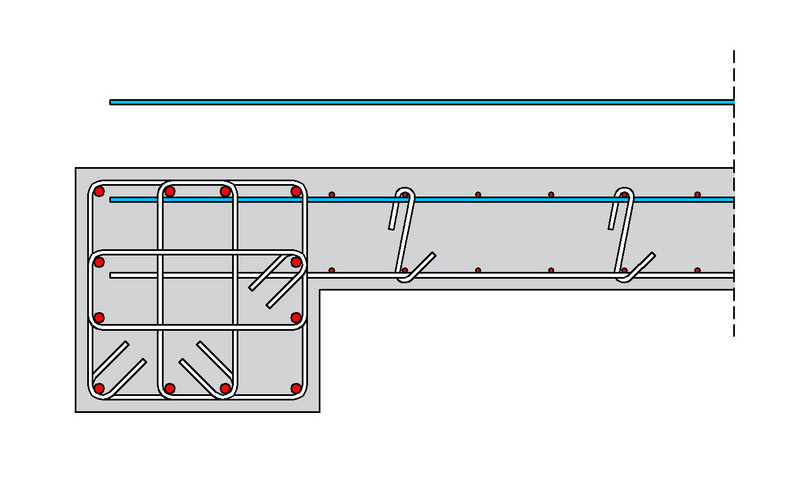 As a conclusion, it is recommended to use a straight bar anchored inside the boundary column because apart from the other advantages, it provides the required cover depth for the ‘S’ shaped bars when they go around both the horizontal and the vertical distribu-tion rebars at the same time. (d) Anchorage by encircling the boundary column and ending in a hook. No matter if the column is strong or weak, the horizontal rebars must end in a hook which will be placed on the inside of the confined column. When the column’s width is not large enough to provide an adequate straight length of anchor-age, hooks bent at 45° (135°) are being used. These are either completely prefabricated so as to be 45° bent in both edges, or they are assembled on the site with horizontal rebars with ends bent at 45° and 90°. These will be alternately placed along the height. 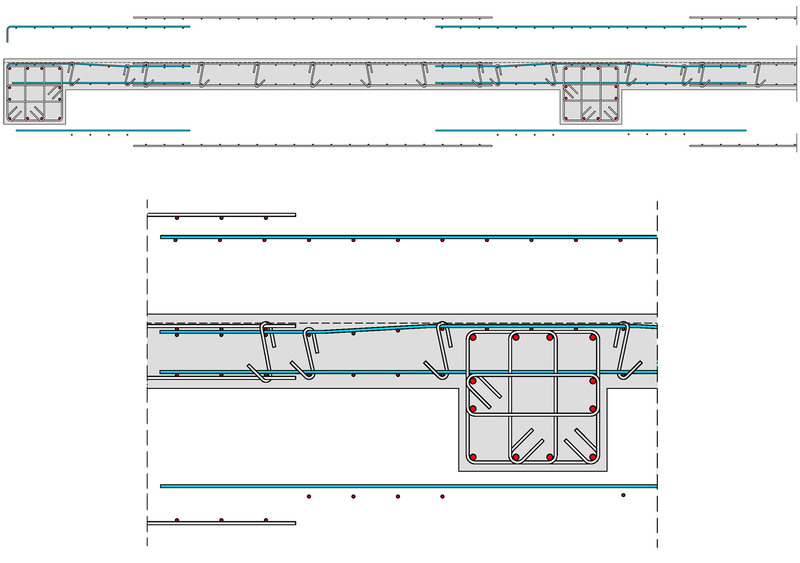 In continuous basement shear walls the difficulty in the reinforcement implementation lays in the column area. In order to overcome this difficulty straight distribution rebars may be placed there. These bars have a relatively small length. They will be lapped with the larger intermediate dis-tribution rebars and they will be wired together with the vertical ones. Firstly, the ‘short’ horizontal rebars (starter bars) are placed on either side of the column, fol-lowed by the implementation of the wire meshes as shown on the next page. 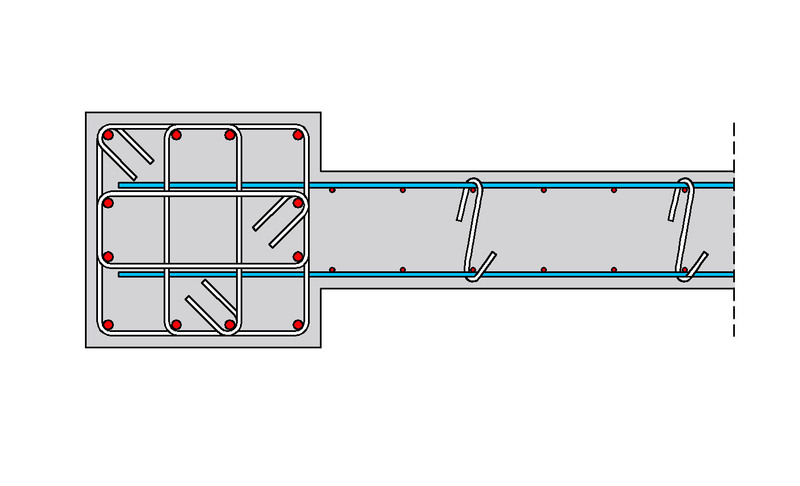 If the industrial wire mesh does not fit to the shear wall’s span length then the short starter bars placed in the columns’ area might have a larger length. In such a case, the vertical distribution rebars between the end of the wire mesh and the column, are placed by hand after the imple-mentation of the mesh. 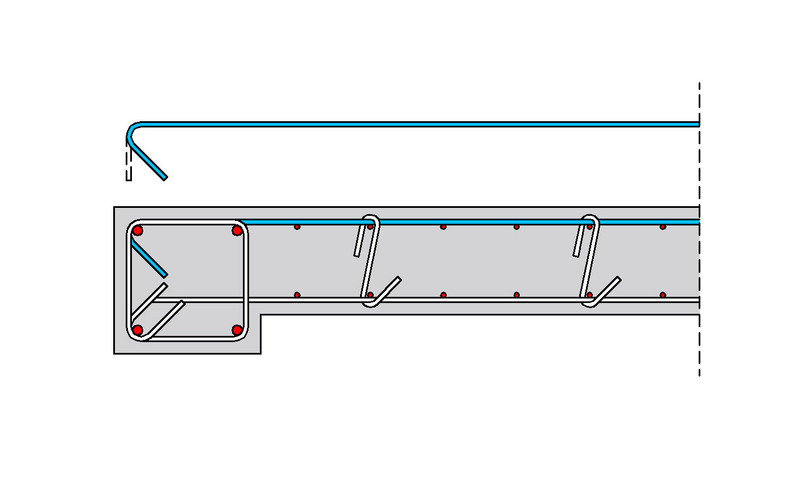 In case the column longitudinal rebar layout creates a difficulty in the implementation of the short distribution rebars, the latter can be bent at their end. Usually, in the perimeter of the building, in the storeys above the ground, there is a seismic joint (30 to 100 mm), or thermal insulation (30 to 50 mm) which are not required in the basement. 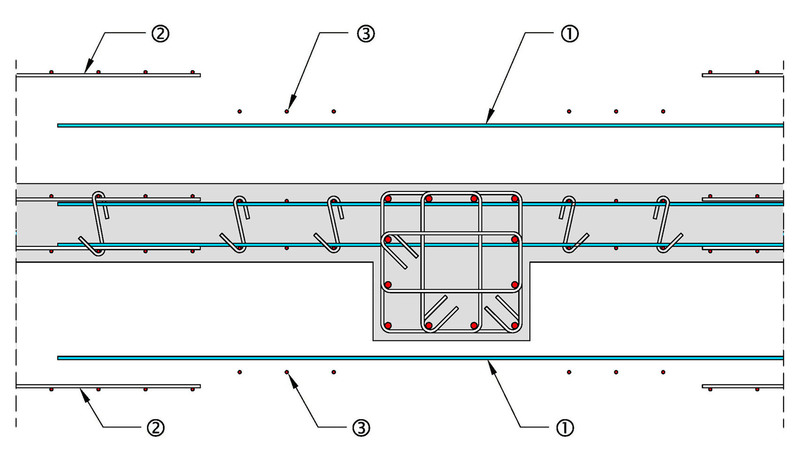 However, their thickness can be used in the basement shear walls to secure the cover depth and to enable the implementation of the distribution meshes outside the column reinforcement, as shown at the following figure.